Michail Pirgelis. Aerovatis (2010). Sprüth Magers Berlin. 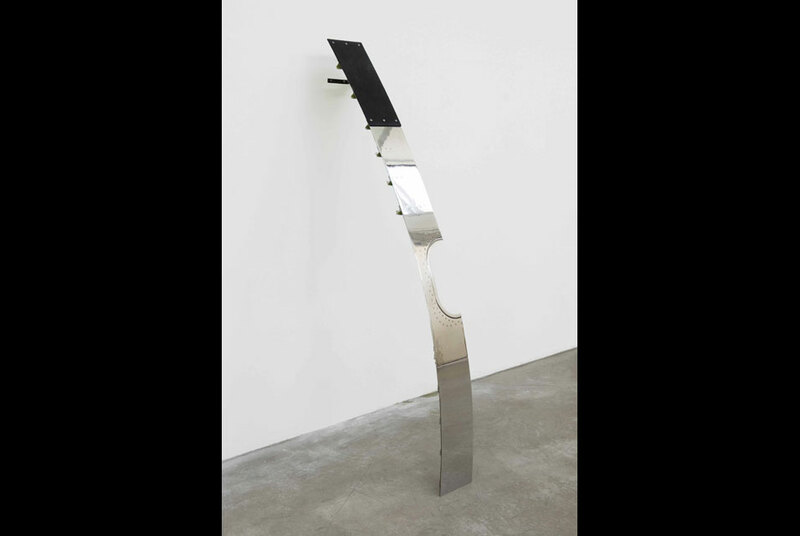 BERLIN.- Sprüth Magers Berlin presents the first solo exhibition of Michail Pirgelis in Berlin. The artist, who was born in Germany and grew up in Greece, is displaying in Ακρόπολης  Acropolis new sculptures and objects which are all based on original parts of airplanes. Pirgelis' works oscillate between readymade, appropriation and autonomous sculpture, but they also transcend these categories, not least of all through the material which he favors. The airplane parts which, even after their actual utilization, continue to be valuable, and which Pirgelis collects from scrap yards throughout the world, extend the history of the objet trouvé by establishing an extreme position. The concentration on the airplane, which has been optimized with regard to its utilization by human beings in accordance with natural law, situates the works in a productive discourse concerning the relationship between humanity and the technological progress which has had a decisive influence on a modernism characterized by reflection. Flight as the most improbable form of human locomotion, together with its mythic connotations, continues in this context to be imbued with a deep fascination. In his exhibition, Pirgelis displays seven new objects. In addition to two sculptures from the Airsaddles series, 2009, brightly polished outer fuselage sections which hang nonchalantly from the gallery wall, he also presents a series of baggage storage compartments which have been transformed into loudspeaker towers. On the one hand, these objects, more than two meters in height, profane the high-tech material through the artistic intervention; and on the other hand, they also make a tongue-in-cheek reference to the technique of bricolage, to assemble and reorganize, as a cultural practice in whatever form. The works of Michail Pirgelis sometimes seem to attain a freedom from their fate of ending up as scrap material. Through the treatment of the artist - the acts of cutting, collaging, highlighting, covering and polishing - the objects reacquire an aura which mass air transportation has taken away from aviation. Particularly in an era when the threats posed by the airplane as a means of transportation - whether from an ecological perspective, or with respect to the latent menace through international terrorism - receive widespread discussion, Pirgelis' art seems to have much to say about the repercussions of the technologies created by human beings. Thus Pirgelis' works achieve their impact, not only through their formal beauty and texture, but also as a reflection upon the dialectical relationship between humanity and technology which goes all the way back to the Icarus myth. On the one hand, the exhibition title Ακρόπολης  Acropolis refers to the archeological procedure engaged in by Michail Pirgelis - the process of seeking, finding, and preparing - but on the other hand, it also opens up a perspective for approaching the subtly understated works of the artist as an expression of fundamental experiences which humanity has acquired during the course of cultural history.